Located on one of the undoubtedly most beautiful islands in the world, Dragan's Den Hostel offers you a relaxing & chilling stay near paradisiac beaches that will provide you unforgettable experiences. Walking, hiking, kayaking, riding bikes or scooters or driving: we will help you to explore the best of Korcula Island. Enjoying the sunset or the Old Town; chilling on the beach or partying: we will help you to explore the best of Korcula Town. Conveniently located - just a 5-minute walk to an idyllic beach, 15-minute walk to the old town - this property offers everything travelers could wish for: a fantastic blend of a nice shared area to chill with a pool and nature around combined with a quiet location. Our hostel gives you the perfect opportunity to meet other travelers; you don't need a travel buddy when you are staying with us. Dragan's Den Hostel is your home away from home: with a pool, free WIFI, air conditioning, two fully equipped kitchens, terraces in each floor (ground, first and second floor), comfortable shared & private rooms and a cool environment to rest and spend your holiday, vacation or any free time. Come to have fun, relax & experience the true Croatian island lifestyle! This place has it all. The staff took me in like one of their own. We were all sharing meals n going to the beach together. Such s nice stay for all occasions. Thanks Dragan!! Dragan was such a nice host! We arrived late at night, he meet us and made us a dinner with fresh apple juice. It felt like at home. Really nice and warm atmosphere. The room was very nice, also was nice to have lunch beside the swimming pool. Really enjoyed my stay. I honestly had the best experience at this hostel, the staff were so friendly and helpful and really got us out of a sticky situation. After we checked out we had an issue on our train to split and ended up in the middle of nowhere and the hostel owner personally came to pick us up and then took us ziplining to make our day better whilst we waited for the next train. Andre and Dino you guys are the best! Everyone should visit this hostel just to experience the great atmosphere! Very underrated hostel. Dragan (manager) was increadibly helpful and always available if I needed something. I had to leave at 4:30 in the morning and I had forgotten to get my passport from the safe the night before, a simple ring of the bell and he was there to get it for me. He provided loads of interesting things to do - would highly suggest the trip to the beach and cliff jumping. Everyone was very kind and interesting. Had everything I would need. Had the best time at Dragans! Great vibe to meet new friends and relax, a kitchen available to use, there's a pool and Dragan can set up activities if you need. The dorms don't have lockers but there is a safe in the common space you can leave your belongings in if you are concerned. A little far from town but it's a nice, safe and easy walk. The location is very far away from old town. It takes at least 25 minutes to walk back and part of the climb is up hill. I would HIGHLY recommend if you choose to stay here to hire a taxi service to take you to and from the port. The hostel itself was clean and quiet. I rented a private room for myself and had my own bathroom. I was able to check in pretty early in the day and the staff was helpful and friendly. The hostel isn't extravagant but was a great value for what I spent. 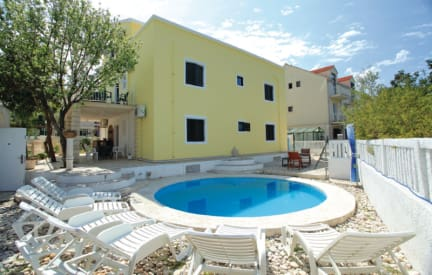 Pros Swimming pool Decent kitchen Nice staff Clean bed Homely vibe Could chill here/use facilities all day on checkout day To consider Room needed a sweep Lacks social vibe 25 min walk from korcula port + town was v. squeaky + could feel the bed springs. Booked female dorm but first night there was a guy sleeping in dorm No lockers in room No map or useful info provided upon check in Would I stay again if I was in korčula? For only 75kn, definitely. Not located in Korcula town, but it's an easy 25-30 minute walk, good wifi, friendly and helpful staff. I booked a bed in a four bed room and managed to have the room to myself for 3 out of 4 nights which was awesome. Main downside for me was that the kitchen door leads directly to an outdoor lounge/dining area where many people smoke. Nice, basic little hostel about a 20-30 walk out of town. Washing your clothes here cost a lot, 100 Kuna. The hostel needs an upgrade, and isn’t very clean. It is an old 3 story house and one of the dorms is in a kitchen/dining area. Our food was taken from the fridge and put in the staff fridge, when we were the only ones staying there. Dragen bought us new bread and chocolates. Our stay was strange, and felt like we couldn’t do our own thing. We came off season, but we didn’t feel comfortable during our stay . Morgan, one of the staff is amazing though!